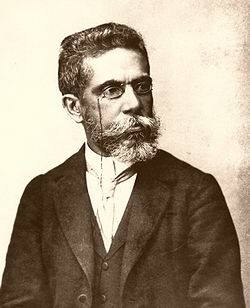 Joaquim Maria Machado de Assis (1839 – 1908) is considered Brazil’s greatest writer. He wrote nine novels, poetry, short story collections, plays and numerous essays. It is his later novels especially; The Posthumous Memoirs of Brás Cubas also translated as Epitaph for a Small Winner (1881), Quincas Borba (Philosopher or Dog? )(1891), Dom Casmurro (1900), Esau and Jacob (1904), that solidified his reputation as a master of 19th Century literature. His style of writing has been compared to that of both Nabokov and Beckett. His work has influenced Brazilian and Portuguese writers. It’s a wonder and a pity that he is not widely read and appreciated in the English-speaking/reading world. So if you like world literature, if you enjoy deeply psychological and subversive narratives novels, if you want a taste of a different classic, then please get one of his books, especially Epitaph for a Small Winner and read it. You will not be disappointed. Several years ago, I set out to read Machado de Assis’ last five novels in order of publication because they are thematically connected. Counselor Ayres’ Memorial (1908) marks the end of this journey. In this book, the widowed diplomat Counselor Ayres, who appears in de Assis’ previous works, retires to Brazil to rediscover his native homeland and to live out the remaining years of his life. This rediscovery, intertwined with a love story, is told by Ayres as entries in his diary. de Assis does an amazing job capturing Ayres’ tone, his demeanor, his sense of self. He is gracious, wise and people of all ages enjoy his company. My nature and my life have given me a taste for and the habit of conversation. Diplomacy taught me to endure with patience an infinity of intolerable individuals which this world nurtures for its own secret purposes. Retirement restored me to myself; but along comes a day when, not leaving the house and tired of reading, I am obliged to talk, and not being able to talk all by myself, I write. The love story that the Counselor narrates revolves around Fedilia and Tristao, who both are the godchildren of childless couple Aguiar and Dona Carmo. It is thought that the marriage between Aquiar and Dona Carmo is modeled after the relationship between de Assis and his wife, Caroline. The Counselor’s diary entries chronicles Fidelia’s transition from a widow bent on a lifelong habit of mourning her dead husband to a woman who rediscovers the world of the living and of love. Written in the late 1880s, the counselor’s diary documents some of the social changes taking place in Brazil. There are several mentions of slavery and its abolition on May 13, 1888. The counselor does not himself engage much with the issue saying that old ways of thinking prevail even as he recognizes that he should assume more responsibility and interest in the matter. This stance apparently reflects the author’s own public disengagement with the issue of slavery and its abolition. de Assis, whose father was a mulatto, has been heavily criticized for not politicizing his works and addressing the plight of black Brazilians in his works. I disagree with this sentiment. Counselor Ayres’ Memorial is slow-paced compared to de Assis’s other works. The prose is simple, the tone sympathetic and at times melancholic. It captures a society most at ease with itself and its aristocratic habits. Because of this, readers of his other previous works, who are used to the biting, wicked and dark humor that infuses de Assis’s writing, might consider this book a lesser work, a lesser masterpiece. Also unlike his other works, Memorial is a work of optimism, of success, of love and it is so closely modeled after some aspects of de Assis’ own life. On my part, the Counselor grew on me and drew me in at the pace of an easy, soft Sunday afternoon. A quiet but satisfying read. Spent the day leafing through books, in particular, reread some Shelley, and also some Thackeray. One consoled me for the other; the other freed me from the former’s spell. Thus does genius complete genius, and the mind learn the varous languages of the mind. Thank you in more ways than one! Excellent excerpt and wonderful piece of work. What are the order of the books that are thematically connected? I think the order is Bras Cubas, Quincas Borba (Philosopher or Dog? ), Dom Casmurro and Esau and jacob. Thanks for stopping by and leaving a comment. Interesting review. I read Epitaph for a Small Winner a few years a go and thought it was very good. His spare style mixed with Borba’s aloof character make for an interesting book. The only thing I didn’t like was his conclusion on what made him a small winner. I completely see your point about his conclusion in Epitaph… Though I didn’t mind it as much. I’ve added him to my wish list 🙂 Great review, the book sounds wonderful. Stu, I haven’t read the short story collection Hats. I do recommend Epitaph… and Quincas Borba. Don’t write him off yet.